I grew up spending summers in Ocean City, and at least one evening out of every vacation was spent eating outside, gaze toward the Little Assawoman Bay at Harpoon Hanna’s. What stayed in my mind most predominantly about Harpoon Hanna’s over the years was the fried clam strips, so it was a wonder, when I returned last May for the first time in forever to celebrate my 23rd birthday, that I didn’t order the fried clam strips. I remembered them as being sooo. Good. And I really did almost order them. But, no longer being the 12-year-old I once was who only ate breaded foods that came with a side of fries, I opted to split the Chesapeake crab dip and the bacon-wrapped scallops with my fiancé. 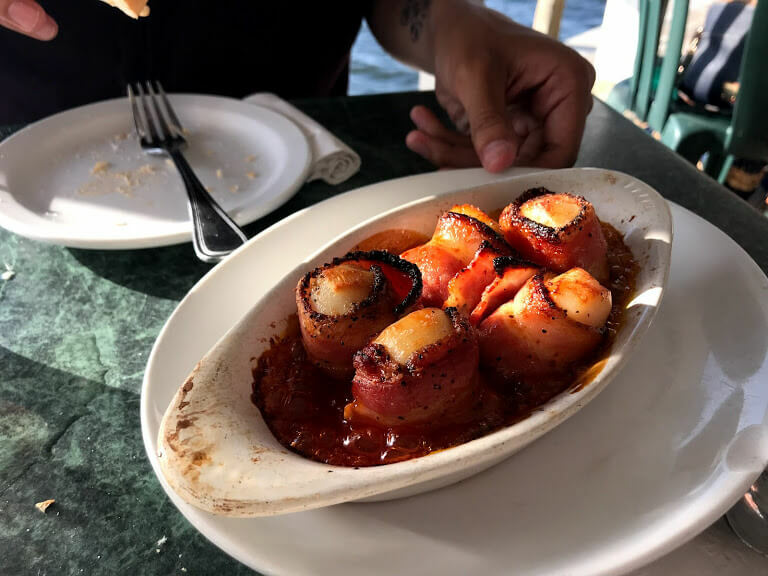 I picked the bacon-wrapped scallops, and he has to order the crab dip no matter where we are, so that was chosen by default. Bacon-wrapped scallops, broiled in a zesty orange sauce. 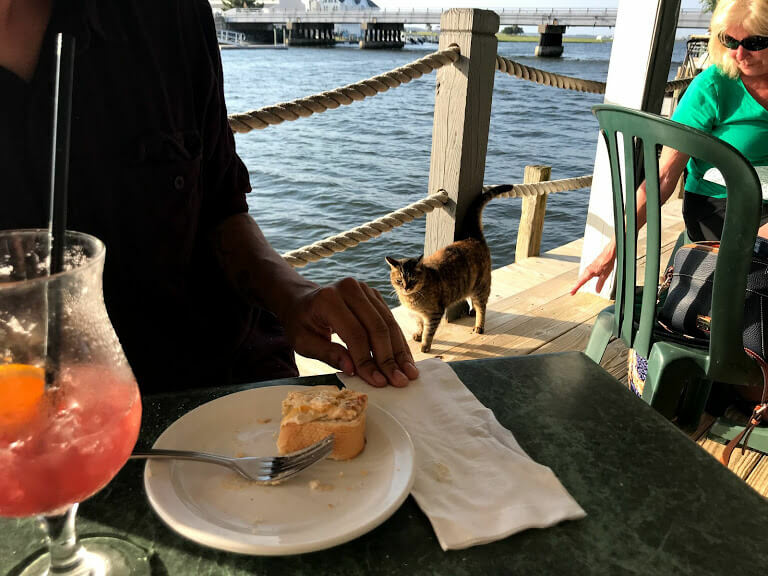 Because that’s his ‘thing,’ I’ve become a just slightly unwilling crab dip connoisseur by proximity; That’s why I was so impressed with our meals at Hanna’s, even if they were only appetizers. The seafood plates, paired with a fruity mixed drink called the Hurricane Hanna and then their Deep Brew Pale Ale, which is brewed by RAR specifically for Harpoon Hanna’s, were matches made in Eastern Shore culinary heaven. 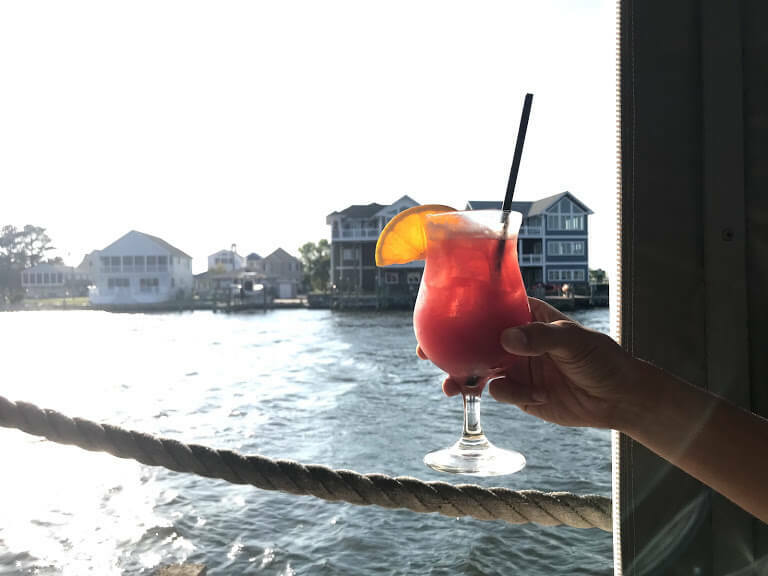 The Hurricane Hanna consists of Captain Morgan coconut rum, dark rum, black raspberry and banana liqueurs, pineapple and cranberry juice. That was last May, just before Memorial Day weekend, when Hanna’s was entering their 36th summer in business. Now, with a refreshed menu and a slate of live musical entertainment booked for every weekend, they’re entering their 37th. Harpoon Hanna’s is open year-round, but to prepare for the summer, owner Wes Hanna said, they hire over 200 employees just for the season. “But we are prepared because of our core veteran staff that’s been with us for many, many years,” he added. The roaming cat may or may not have been one of the veteran staff members. 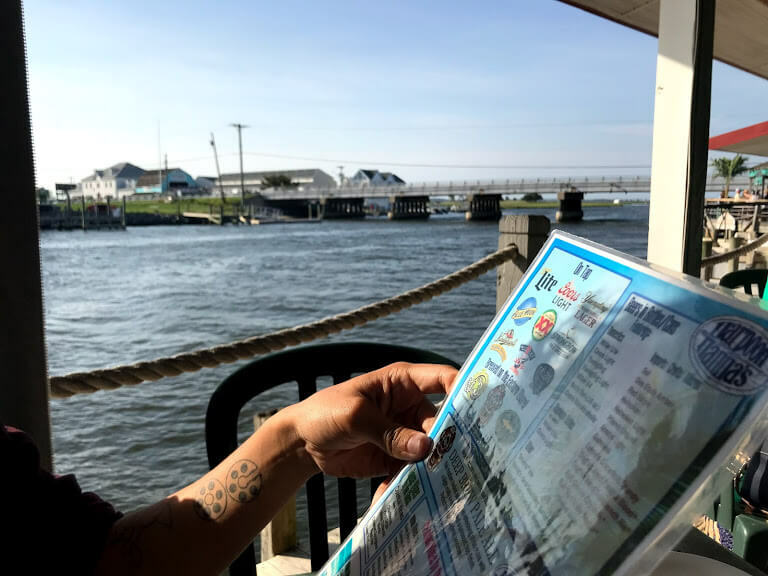 The secret to the restaurant’s success — in addition to its veteran staff and, undoubtedly, its unmatched location on the water on Fenwick Island, DE just three minutes outside of Ocean City — is their food. 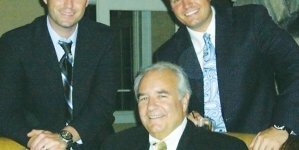 They still use many of Frank Hanna’s original recipes which helped initially establish Harpoon Hanna’s when it first opened back in 1983. 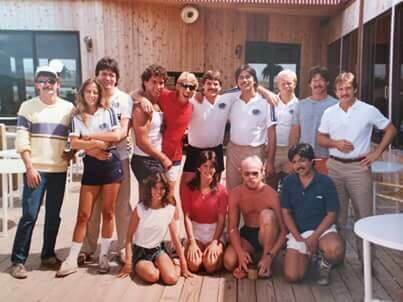 The first Harpoon Hanna’s staff, 1983. Photo courtesy of Wes Hanna. “You won’t find a better crab imperial or prime rib in the area, [and] of course our coconut and blueberry muffins, among others,” Wes said. It doesn’t hurt that there’s also a waterfront view from every seat in the house. Over the years, the facility has grown to include outdoor decks surrounding the entirety of the south property, and every guest can eat fresh seafood while gazing out at the water, whether that’s from the deck, the indoor dining room or Hanna’s Hideout Tiki Bar. 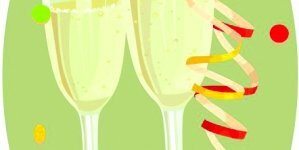 What’s great about operating on such a huge facility, Wes said, is that it can accommodate an intimate dinner for two and a group of 25 all at once — and that’s all year long, not just in the summertime. Part of what makes Hanna’s so special is that they’re open 365 days a year and always have been, so even if you want their crab imperial on Christmas, you won’t be turned away. 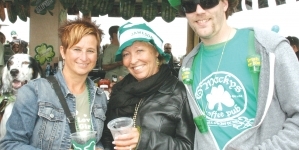 Long-time Hanna’s loyalists and newer clientele come in November for the half-priced Lobster Blowout, then come back January through April for half-priced prime rib nights. On those nights, it gets so packed that it looks like summertime, even when the heavy coats and icy patches on the water say otherwise. Harpoon Hanna’s had added a few new menu options for 2019, including chicken and waffle sliders, cheesesteak flatbread, crab cake caesar, southern crispy chicken sandwich, fried grouper sandwich, prime rib sandwich and blackened scallops over cheesy grits. 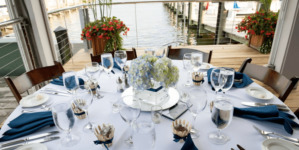 However, their signature items — including the jumbo lump crab imperial, the slow-roasted prime rib and the homemade bread and muffins with every meal, among a few other things — will always remain on the menu. 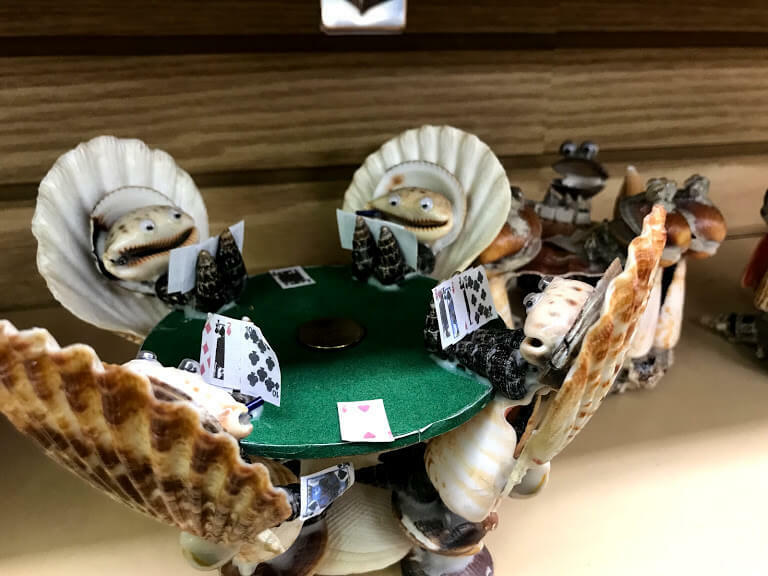 As an aside, we stopped at Sea Shell City after dinner that evening and found these fun guys playing a game of cards — though this is only related to Harpoon Hanna’s in that it’s just another thing to love about the Eastern Shore.